Include a variety of healthful foods from all 5 food groups on MyPlate: vegetables, fruits, grains, protein, and dairy. Think of snacks as mini meals in order to help plan your day of healthy eating. Check your refrigerator, freezer, and cupboards for items you already have before going to the store. Make a grocery list and stick to it to help stay within your budget. For perishable foods, buy only what you can eat or freeze to minimize food waste. Get creative to use up leftovers. Practice good food safety habits. Eat leftovers within 3 to 4 days or freeze to enjoy another time. 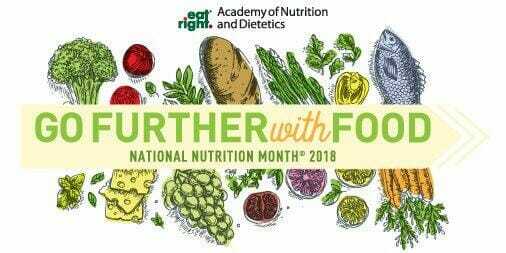 Celebrate National Nutrition Month and Go Further with Food. For more information about National Nutrition Month®, including activity handouts for kids and adults, visit the Academy of Nutrition and Dietetics’ website at www.eatright.org. For more information regarding MyPlate and the food groups, visit www.choosemyplate.gov. Adults participating in the UC CalFresh Nutrition Education Program are learning about topics such as MyPlate, meal planning, shopping on a budget, and food safety. Workshops are available for qualifying adults at no cost. For more nutrition or program information, please call (530) 889-7350 or visit our website at http://ucanr.edu/sites/letseathealthy. “Like” us on Facebook for additional tips and updates at UC CalFresh Nutrition Education Program, Placer/Nevada Counties.